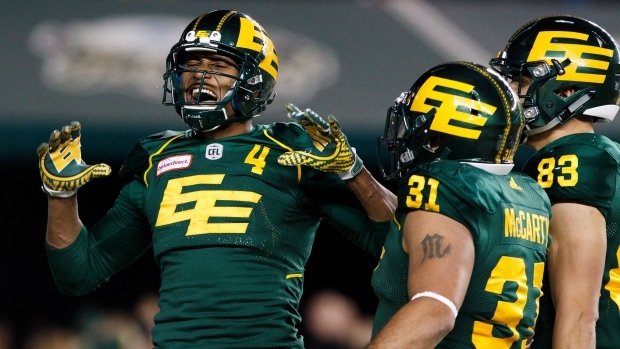 EDMONTON — The Edmonton Eskimos re-signed American Vidal Hazelton to a one-year deal but released veteran Adarius Bowman rather than pay him a $140,000 roster bonus. A source told The Canadian Press last week that Bowman, 32, was due the bonus Monday. The six-foot-three, 215-pound Bowman had a club-record 120 catches for a league-high 1,759 yards and nine TDs in 2016. He then signed a contract extension through 2018 that at the time made him the league’s highest-paid non quarterback. Bowman reportedly earned $260,000 last season and was scheduled to make $265,000 this year, including the bonus. He now becomes a free agent. Bowman cracked the 1,000-yard plateau three times over his six CFL campaigns with Edmonton. But last year, Bowman had 45 catches for 534 yards and five TDs over 12 regular-season games before adding five receptions for 96 yards and two touchdowns in two playoff contests. The six-foot-three, 212-pound Hazelton appeared in 11 games last year with Edmonton, registering 55 catches for 709 yards and four touchdowns. Hazelton has appeared in 35 games over three CFL seasons, accumulating 152 catches for 1,873 yards and 13 TDs.